My friend Margaret and I are both avid golfers and enthusiastic oenophiles. The Okanagan Valley with its 200-plus wineries and string of championship golf courses was a no-brainer when it came to choosing a getaway destination. 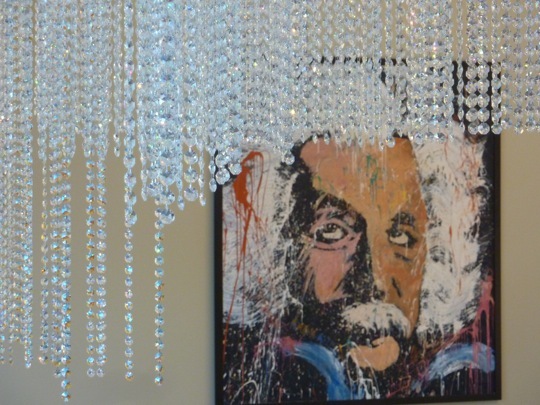 And now, with the opening of Sparkling Hill Resort in Vernon, owned by Mr. Gernot Langes-Swarovski, (patriarch of the famed Austrian crystal family), we’d be adding some bling to our swing. The state-of-the art facility, carved into a hillside overlooking Predator Ridge Golf Course is unlike any other destination spa resort in Canada. For starters, the organic, airy interiors are embellished with $10 million worth of Swarovski crystals—from chandeliers in the shape of maple leafs to cleverly illuminated “fireplace” sculptures beside the deep Kohler soaker tubs in the 152 rooms. The resort’s 40,000 square foot KurSpa, the largest in Canada, consists of rose, crystal and salt steam rooms, three saunas and multi-“fauceted” showers, The aqua area features a hot tub, indoor and outdoor salt-water pools and a Kneipp waterway with alternating hot and cool temperatures to stimulate your circulatory and lymphatic systems. In between steams and dips you can work out in the fitness studio, sip tea or relax and enjoy the view in the Serenity Room. The concept of the KurSpa (Kur means cure in German) is based on European wellness retreats where guests usually start their stay with a medical consultation. Leading the Sparkling Hill team is naturopathic physician Dr. Ray Lendvai, whose goal is to “help people take their health to the next level so they can experience balanced, vibrant vitality and well-being.” That next plateau will include nutritional counseling, acupuncture, or vitamin B injections. Pampering at Sparkling Hill comes in the form of myriad massages, mud wraps, facials, aesthetic treatments and body scrubs. I wouldn’t call it pampering but the KurSpa’s cold sauna is supposedly good for whatever ails you, from alleviating joint and muscle pain and inflammation to curing depression. Whole body cryotherapy works by cooling the body, which shrinks blood vessels, which increases blood flow, thus reducing inflammation. Sparkling Hill boasts the only cold sauna in North America so Margaret and I decided to give it a try. We were instructed to wear bathing suits, shoes and socks and to remove all jewelry. After having our blood pressures taken, we were given earmuffs, face masks and gloves. (Yes, we were a sight for sore eyes.) Then we stepped into the chamber chilled to -110 degrees Celsius. Burr! The goal is to endure three minutes; Margaret and I barely made it. Ideally, folks sign up to ten or more big chills. One was enough to make us feel sufficiently exhilarated to tackle the new Ridge Course at Predator Ridge just down the hill. Doug Carrick’s 7,190-yard design seamlessly blends eight completely rebuilt holes of the old Peregrine course with ten new fairways carved through rugged mountain terrain. “Now we approach phenomenal,” remarked director of golf, Doug Goubault, as we climbed to the number five signature hole of the aptly named Ridge. Indeed. 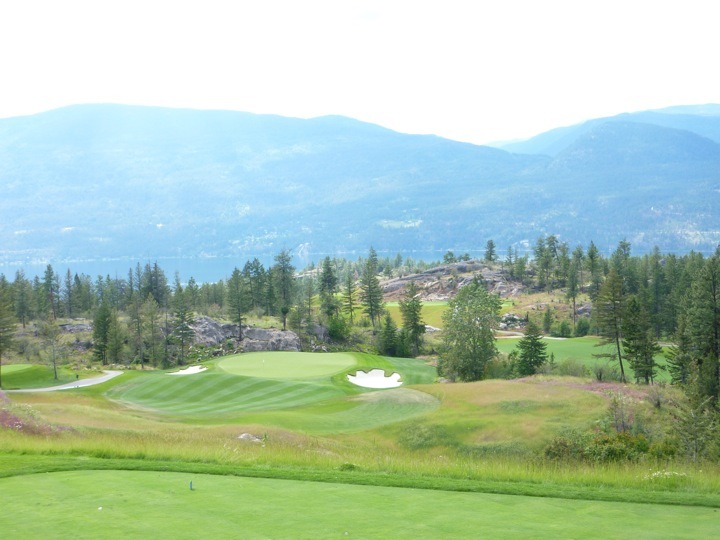 From the elevated tees of the gorgeous par-three golfers inhale panoramic views of the violet-tinged Monashee Mountains, granite rock outcroppings and sparkling Lake Okanagan below. A couple of deer bounded gracefully out of the trees for added effect. Apart from the drop-dead natural beauty of the place, and a four-and-a-half star rating from Golf Digest, Predator Ridge now boasts 36 holes of golf—the new Ridge and The Predator that has hosted two Skins Games. Further north, “Boom-Boom” PGA pro Fred Couples created his signature debut western design in collaboration with Gene Bates in 2008. Aptly named, The Rise, the 6,884-yard roller coaster is set 400 metres above Lake Okanagan. The sixth hole, an elevated-tee 192-yard par-three, is a sight to behold. To your right, water washes down a natural black rock cliff face. Beyond, the valley view stretches to a green infinity. And 100 feet below, the green teases from behind a glistening pond at the foot of the waterfall. Bring your camera. This course is truly a drama queen and don’t be surprised if your ears pop due to the 1900-foot altitude. Our game plan was to secure early enough tee times so that we could pair 18 holes and a winery visit each day. We were spoiled by choice. 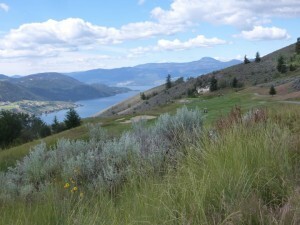 The Okanagan Valley, a 135-mile-long fertile belt, running between the lower Monashee Mountains to the east and the Cascade Mountains to the west, begins at the northern Canadian tip of the Sonoran Desert and runs up to Vernon, British Columbia. This semi-arid geographical jackpot basks in an average of 2,000 hours of sunshine annually making it the fruit-growing capital of Canada, producing apples, peaches, plums, apricots, cherries, raspberries and grapes that ferment into award-winning wines. The sunny, temperate climate also supports a longer golf season than many places in Canada—hence the moniker, Napa North. After our game at Tower Ranch we headed over to Cedar Creek Estate Winery, named Canadian Winery of the Year in 2005. 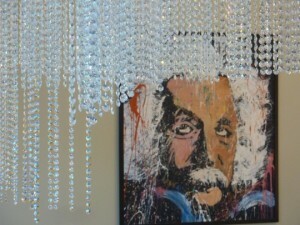 Almost every winery in the valley welcomes visitors for tours and tastings and most have an excellent restaurant. The majority boasts great views of Lake Okanagan where Ogopogo, the giant green serpent monster purportedly lurks. Cedar Creek is no exception. The Terrace restaurant is open for lunch daily and dinner on Friday evenings. Chef Judith Knight, who has cooked for Kevin Costner on his yacht, follows a farm-to-table philosophy sourcing seasonal local ingredients for her stellar dishes that might include a curried corn soup, duck confit, seared scallops or a platter of tapas. The wines aren’t bad either, especially the Platinum Reserve Pinot Noirs for which Cedar Creek has garnered many awards. Although we found all those involved in Okanagan’s grape industry to be passionate and innovative, the quirkiest of them all is Summerhill, Canada’s largest certified organic winery. Owner Stephen Cipes gave up his real estate business in New York and started planting grapes here in 1986. 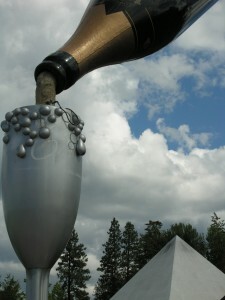 Summerhill Pyramid Winery was named Wine Producer of the Year for 2009. Back in 1991 Cipes Gabriel won the gold medal at the Chardonnay du Monde event, beating French Champagne. However, with considerable earth moving and a brilliant design by Bill Robinson and Les Furber, you can turn a canyon into a fine golf course. Gallagher’s Canyon Golf and Country Club, named after the hermit who used to live here, has been ranked among Canada’s top 50 courses. 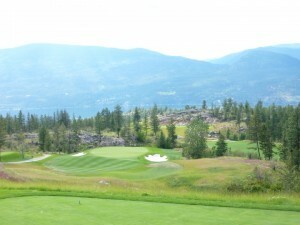 This quintessential Okanagan golf odyssey swoops into an around the deep canyon for which it was named. No visit to the Kelowna area would be complete without a trip over the bridge to the west side of Lake Okanagan to Mission Hill Family Estate. 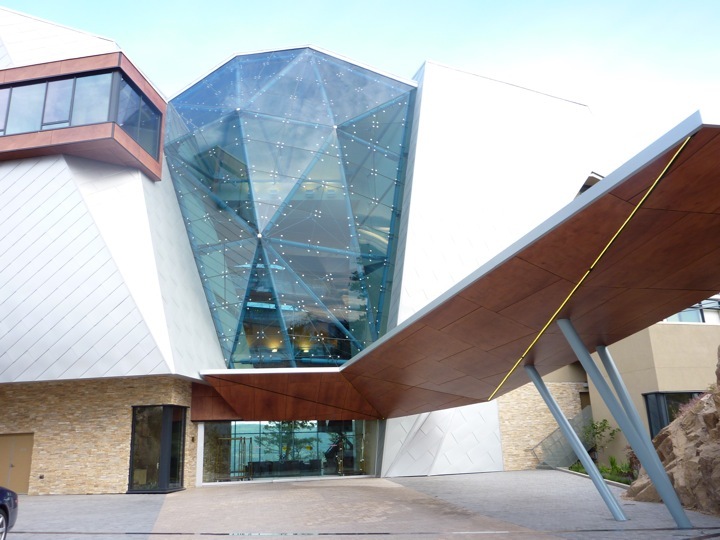 In peak season Mission Hill sees over 1,000 visitors per day, our wine educator Kimberley informed us, as we passed under the Roman arch and rose gardens and gazed beyond to a 12-storey bell tower and grassy amphitheatre where summertime concerts are held. The al fresco Terrace Restaurant, overlooking the lake, serves over 20 wines by the glass to accompany such dishes as smoked trout with peach chutney, Queen Charlotte halibut and forest mushroom tart artisan cheeses. We spent our last morning in downtown Kelowna’s Cultural District browsing through the galleries and boutiques around Waterfront Park. At the well-stocked VQA Wine Shop, housed in the Old Laurel Packing House, we picked up a few liquid assets as souvenirs. How could we resist offerings from Therapy Winery with names such as Freudian Sip and Pink Freud? Or Blasted Church’s late harvest Blastphemy? Housed in the same building, the BC Orchard Industry Museum tells the story of how the missionary, Father Pendosy planted the first apple trees in the Okanagan. I suppose the valley’s love affair with the grape began in the 1850’s when that very same French-born Oblate friar experimented with making some sacramental wines. Here’s to you, Father. Many of these courses are members of a new Golf Kelowna website and booking system that provides golfers with one-stop shopping and savings on stay-and-play packages for sixteen local courses .